Bliss is defined as perfect happiness or great joy. This Vine was filmed while I sat on the soft white sands of the gorgeous St. Regis Resort at Le Morne, on the southwestern tip of the Indian Ocean island nation of Mauritius. The crystal-clear water lapped gently around my legs as I positioned myself carefully to record these scenes with my iPhone. In the distance, I could see the waves from the open ocean breaking on the lagoon’s outer reefs. Further up the coast, I spotted many kite-surfers – the lagoon at Le Morne is one of the best places in the world to learn how to kite-surf due to its steady winds and relatively calm waters. The colours of the lagoon, ranging from turquoise to aquamarine and emerald, were simply mesmerising. I felt the warm breeze in my face and the soft sand under me. I could hear the breeze rustling the fronds of the palm trees that lined the beach. My mind was filled with nothing but the images, sounds and scents of this paradise. Everything looked and felt so surreal, like a dream we all dream of having… every night. The amazing beach at the St. Regis Resort Mauritius. A tiny nibbling feeling snapped me out of my dream-like state. I caught a glimpse of a few fishes happily pecking on my toes before they dashed off. I chuckled. You even get a skin exfoliation in this dream! I felt so relaxed and happy. An immense sense of gratitude washed over me; I was thankful for this joyful state and for the opportunity to experience this little paradise. Bliss never felt this good! The St. Regis Mauritius is a sprawling new luxury resort at the foot of the World Heritage listed Le Morne mountain. This colonial-style resort has 172 rooms and suites which are located in double-storey villas scattered along the beach, many with breathtaking views of the lagoon and the ocean. My room was very spacious, with a large bathroom (separate shower and bath-tub), a bar, working table and a cosy terrace outside. Each cluster of villas has its own pool and butler service. The beach is never more than a few steps away, and because the property is so spread out, it always feel tranquil. A blissful getaway indeed! The villas are just a few steps away from the beach. The main pool at the St. Regis Mauritius. 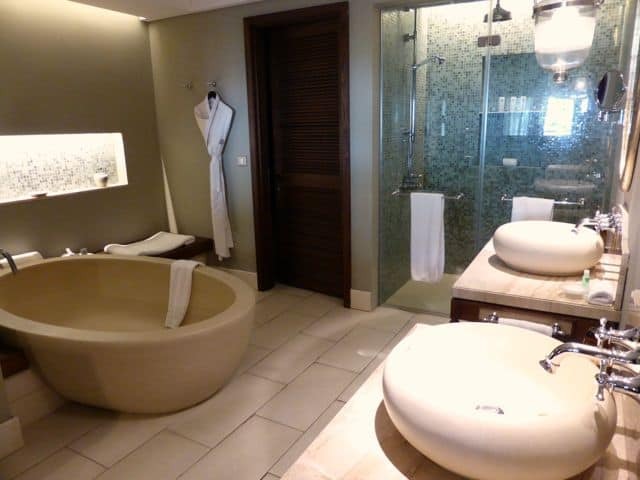 My room at the St. Regis Mauritius. There are several restaurants, including Simply India, the signature restaurant by Michelin star chef Atul Kochhar, as well as Japanese and Thai outlets. My favourite spot was at the Boathouse Bar & Grill. Fronting the beach, the restaurant serves a variety of local specialties and seafood. This is the perfect spot for a meal or a drink with a fabulous view of the lagoon and the sunsets. My favourite spot: the Boathouse on the beach. And the sunsets here are stunning! The resort also has its own wellness centre, the gorgeous Iridium Spa. There’s a big variety of treatments to choose from, from relaxing massages to re-energising treatments. The treatment rooms are spacious and there are even bigger rooms for couples. I especially love the breezy lounge where guests can rest and relax after a treatment. A treatment room at the Iridium Spa. The St. Regis Mauritius enjoys a stunning location on one of Mauritius’ most beautiful stretches of sand whilst the imposing Le Morne mountain provides a welcome shelter from the strong easterly winds. Everywhere I went, from the front desk staff to the butlers and the waiters, I was greeted by friendly personnel sporting big smiles. If, like me, your idea of bliss is a tropical beach, bewitching colours and a luxurious resort, then this place is perfect for you! Note: This content is the result of the #MyMauritius blog trip that was created and managed by iambassador and AHRIM in association with the Mauritius Tourism Promotion Authority and Air Mauritius. Velvet Escape maintains full editorial control of the content published on this site. Great video, I can feel it and smell it! Your photos and the video made me feel like I visited there myself. Thank you! Seems like Mauritius knows how to do paradise quite well. It seems to be on the shortlist of places that offer this sort of beachside perfection. Every photo I’ve seen looks great. Perfect Post title – easy to see the St. Regis Mauritius knows what bliss is and happily delivers that commodity with style.